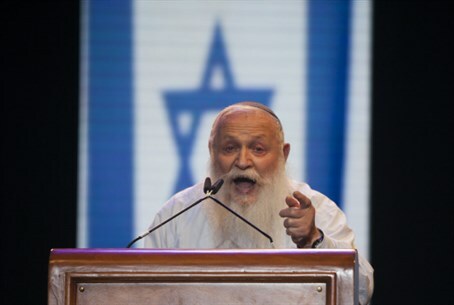 Chairman of Bnei Akiva and religious-Zionist leader Rabbi Haim Druckman gives special blessing to IDF, predicts victory through unity. Rabbi Druckman referred to the concept of milchemet mitzvah, whereby certain wars are Torah-mandated for men to serve - such as to defend the Jewish people from attack. "Our soldiers are fighting God's War," he said. "This war determines out very existence in this country." "This war is for real peace, as told about in Isaiah: 'And your peers shall have swords ... and no nation shall lift up a sword against your nation, which is not knowing another war. '," he added. ''Israel does not strive for another war, for deaths; each Iron Dome cost a fortune - who needs it?" he continued. "But there is evil in the world and we must fight that evil." "Our ancestors fought, Abraham fought, Moses fought," he reassured. "Our aspirations are indeed that 'the wolf will live with the lamb' [citing the verse in Isaiah about the Messianic era - ed.] but if the sheep does not deal with the wolf, nothing will be left of the sheep." "This is a holy war by all accounts, a war of salvation and for the existence of Israel in its homeland," he said. "You see, at funerals of individual soldiers, tens of thousands of people - where else is there such a world?" he reflected. "Individuals who are not close relatives and friends arrive." "These enemies of Israel - with God's help we will overcome them, as we have overcome [our enemies in] all of Israel's wars," he concluded.